PRESIDENT Emmerson Mnangagwa has warned party insiders bent on derailing his presidential campaign through divisive tendencies after some party officials organised another rally for Vice-President Constantino Chiwenga at Zhovhe Dam on Wednesday while the Zanu PF presidential candidate was at Dulivhadzimo Stadium in Beitbridge. An estimated 400 people turned out at Chiwenga’s rally, with the majority of supporters opting to attend Mnangagwa’s address, according to sources. Mnangagwa had gone to Beitbridge to commission the $241 million upgrading and modernisation project at the border post. Zanu PF insiders blamed Matabeleland South provincial chairman Rabelani Choeni for organising what they called an “internal counter-attraction” during a presidential visit. During the rally, Mnangagwa said some people had wanted him not to travel to Beitbridge, but he felt it was his duty as a “servant of the people” to come and address the rally. “I am a servant of the people. All those seeking to be elected are your servants and you should tell them that,” he said in what sources believe to be a veiled reference to Choeni. Chiwenga, however, said the presence of two powerful delegations in the same province was to show the leadership’s high regard for Matabeleland South. “Choeni misinformed the party headquarters that we needed another rally at Zhovhe on the same day. It became a counter-attraction the same day President Mnangagwa was in Beitbridge,” a source close to the developments said. Unlike earlier claims that the rally at Dulivhadzimo was unscheduled, the extent of the preparations, including the engagement of an events management company which pitched expensive tents and brought a powerful public address system and tight overnight security at the stadium showed the rally was properly planned. “Organisers of State functions, led by the provincial administrator and top security personnel, were here to supervise the set-up in the stadium,” another source said. 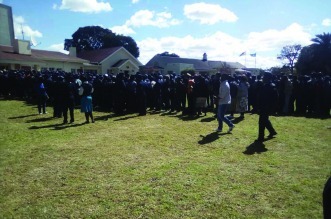 A metal barricade complemented by police and army human wall separated the crowds from the podium, some 20m away, a clearly new security feature following a suspected bomb blast in Bulawayo, which injured 47 people, including Vice-President Kembo Mohadi and Zanu PF national chairperson Oppah Muchinguri. Two other people died as a result of the blast from an object hurled at the VIP stand, which narrowly missed Mnangagwa as he was leaving after addressing a rally. Zanu PF members in Beitbridge said Choeni was always being controversial and disagreeing with others. He was accused of drawing up a list of his preferred candidates for the nomination court, which was eventually thrown out by the party’s commissariat. In the list, he included himself as the party’s Beitbridge senatorial candidate in place of Tambudzani Mohadi, who had trounced him in the primary elections. After the commissariat reverted to the original list of winning candidates, Choeni called for the ouster of his party’s national commissar Engelbert Rugeje, accusing him of imposing candidates. Choeni, who has in the past accused NewsDay of being biased, was not picking calls for a comment.